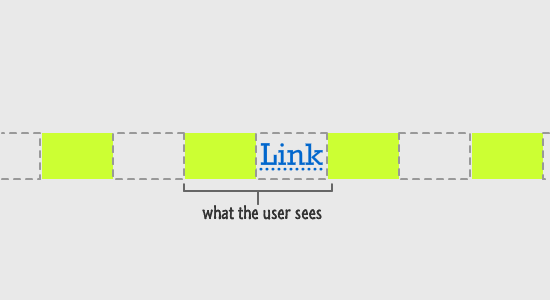 A link's hover state is very similar to cardboard boxes. The fun things you can do with them are endless. One fun thing that you will learn about in this article is how to have a background color slide into view when you are hovering over a link. When you hover each link for Jerry, George, Kramer, and Elaine, notice what is happening. A light green background slides into view, and the same background slides out when move your mouse away. Pretty awesome, right? In the following sections, let's look at how this is done in English as well as CSS. First, before we dive into the implementation details, let's take a few steps back and talk in English about what is going on. To give away the ending, in a nutshell, the sliding effect you see is nothing more than a positioning trick involving a background color...and a whole lot of little CSS background shenanigans. Allow me to elaborate. Here is what you need to be aware of this background. 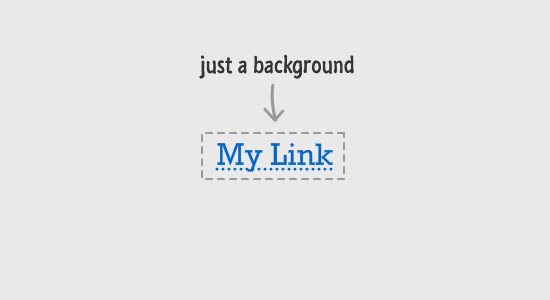 This background's dimensions are the bounding box of your link. 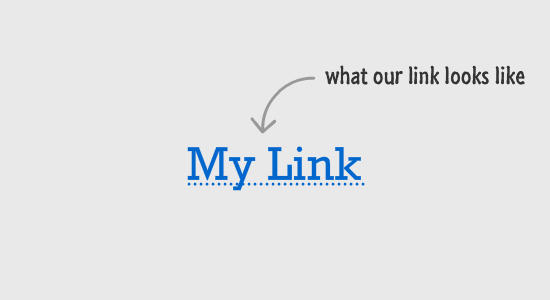 Any content around your link will not be affected by this background unless you make your link itself larger or do other weird things with it. 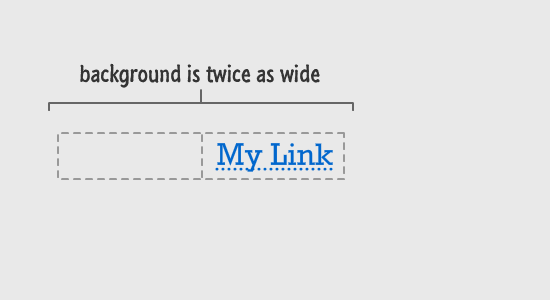 More importantly, any part of your background that goes beyond this bounding box will not be visible. Keep that in mind when looking at the diagrams where I give you more details to help you understand what is going on. By now, how this effect works should be getting clearer. All that is missing is the background itself, for we are still currently dealing with something that is transparent. The way you create something that looks like two colored rectangles arranged side by side like in our example is by using a gradient. Now, because this section is an overview, I was deliberately vague on some details. In the next section, we'll remove some of the vagueness and (at the same time!) 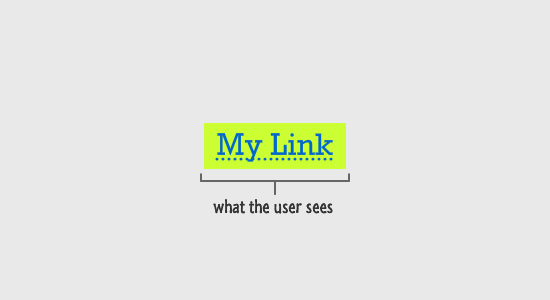 see how everything shown here gets translated into the CSS that your browser understands. Understanding how this effect works is really the hard part. Once you have a good understanding of all that, the rest is pretty easy. In this section, we'll look at the actual implementation and see why things work the way they do. First, let's get this example running on our machines. Go ahead and create a new HTML document and add the following HTML and CSS into it. If you save and preview your document, you should see an identical replica of the example you saw earlier. Now, while all of these lines of HTML and CSS are important, some of them are more important than others for understanding how this effect works. Take a few moments and look at the contents of these two style rules. Try to map what you see to what you learned about this effect in the previous section. One of the nice things about the CSS properties is that they are somewhat descriptive of what they do. That helps in trying to understand what is going on. Once you are ready, let's move on and look through this CSS together. Let's dive through each of these highlighted lines in more detail. Explaining the full syntax for what goes into a gradient goes well beyond the scope of this article, but just to look at what we have here, the to right value specifies that this gradient's angle is rotated by 90 degrees. 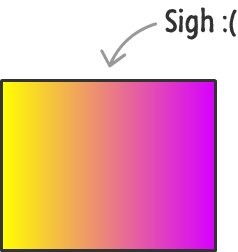 If I didn't specify this, our gradient will be moving vertically as opposed to the horizontal direction that we want. The next four lines define our gradient stops. They are the 0%, 50%, 50%, and 100% stops respectively. 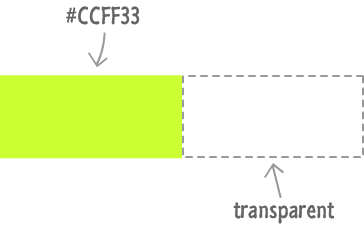 For the first half of the gradient as defined by the 0% and the first 50% stops, the color is set to #CCFF33. That is the light green color you see in the background when you hover over a link. The second half of the gradient is defined by the second 50% and 100% stops, and for these I specify a color of transparent. This means our link's background will show whatever it is inheriting from its parents. In this background-position property, I am specifying that this background is offset by the full width of our link. In a world where things make sense, that's what it would seem like I am doing. Reality can be quite cruel at times...especially if the W3C spec for this situation has anything to do with this. If this all sounds kind of weird, that makes two of us. This isn't the last we've seen of this property though, so stay alert for parts II and III of it. We still have some more changes to make, so we aren't done yet. Don't worry if your link looks awful at this stage of things. The first value defines the horizontal size, and the second value defines the vertical size. 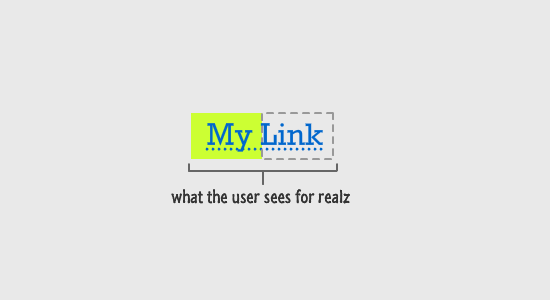 Because we have a horizontally sliding effect, the horizontal size is set to 200% to indicate that the width is double the width of our link. The height is just kept at its normal value of 100%, for we aren't going to be doing anything with it. If you are wondering how doubling the size of our background also ended up shifting the background to perfectly do what we wanted, here is a hint: blame the background-position property. 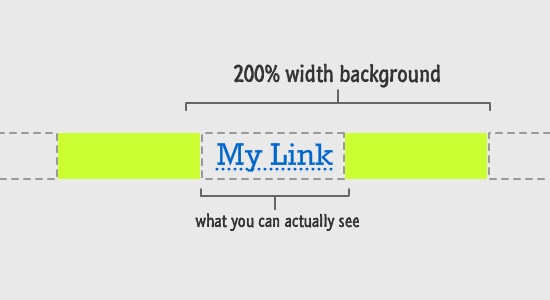 Because our background is now twice the width of our link element's width, think back to the formula we talked about earlier. The background-position property is specifying a value that is -100% (element width - background width) multiplied by the specified value of 100%. The computed value for this property at this stage is -100%, and this means our entire background is shifted left by 100% of our element's width. This shifting coupled with the doubling in size ensures we get what we want. Yay! 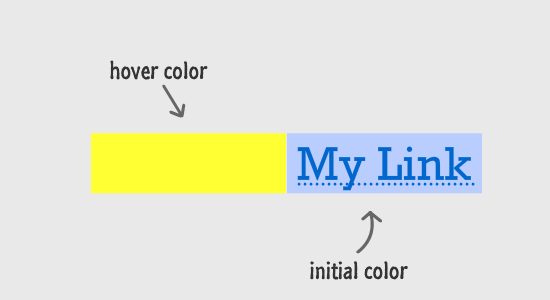 In the previous section, you learned all about how your background color is defined when your link is in its normal and natural state. In this section, let's look at what happens to our background when you hover over the link. 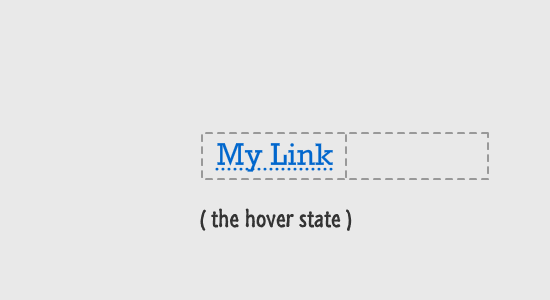 The hover pseudoselector ensures that this style rule only becomes active when your mouse is hovering over our links. You can learn more about the various states and how you can style them in my Styling Links in CSS tutorial. Despite all of the explanation and background (ha!) that I've provided, what you (and your visitors) actually see in the browser is not nearly as complex as what goes on behind the scenes. All your users see is the first half of the background gradient sliding in from the left. 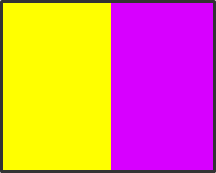 The second half of the gradient will reappear once they move the mouse away and have the link return to its normal state. Simple! This transition declaration ensures that his hover effect is a slide as opposed to a boring jump where no animation happens. This is all made possible thanks to the all keyword which ensures that all of your various property changes between the normal state and your hover state are animated. 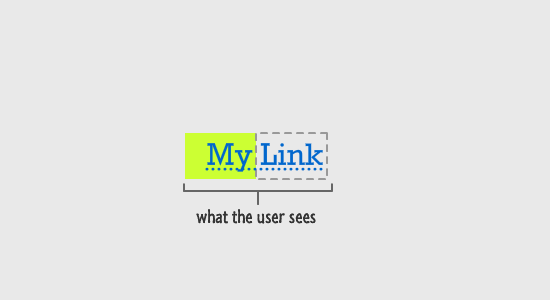 This means your link foreground color and the border color are animated. This also means that the change you made to your background-position property is also animated. Rounding out the rest of the values, your transition will run over a duration of .2 seconds with an ease-in easing function applied. All it took was just one line to get your transition to play...and to make this awesome effect actually awesome!